We offer this marvelous sweet to our esteemed clients after beautifully decorating it with silver paper. This range of sweet is one of the most suitable items for any occasion to be served to the guests. 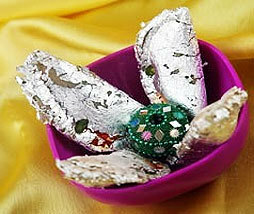 Description :Made of kaju, mawa, dry fruits and silver foil applied over it for beautification.